Janzen Robinson is a man lost between two worlds. Five years removed from a life as an apprentice to a group of do-gooding heroes who championed the fight against supernatural evils, the once-promising student is now a package courier going through the daily grind, passing time at a hole-in-the-wall bar and living in a tiny, run-down apartment on the south side of Cleveland, Ohio. Then fate (or a case of bad timing) brings him face to face with a door that’s got his old life written all over it. From the ancient recesses of unyielding darkness known as the Abyss, a creature has been summoned: a Stalker, a predator whose real name is forbidden to be spoken aloud. It’s a bastardization of the natural order, a formidable blend of dark magic and primal tenacity. It’s single-minded mission? Ending the life of a fiery, emerging young witch. Thrust into the role of protector, a role once reserved for those he’d lost years ago, the out-of-practice Artificer not only has to return to a life he’d left behind but must relive that painful past while also facing down the greatest threat to come to our world in a century. Janzen will have to journey through the magical underbelly of the city and stay one step ahead of an unstoppable monster hellbent on destruction while also trying to figure out why it’s been brought to our world. Old wounds are reopened as Janzen looks too old friends, a quiet stranger, and his own questionable wits to see them all to the other side of this nightmare that may cost him his life and, quite possibly, the world itself. 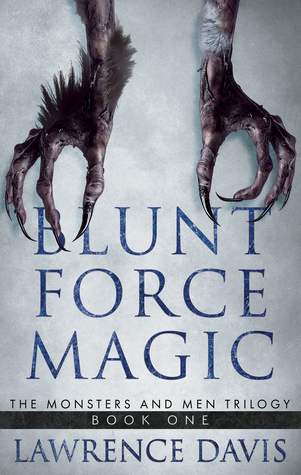 When I started reading Blunt Force Magic, I didn’t know what to think of it. But, I like to give books a chance, so I dived right into reading. By the end of the first chapter, I was ready to DNF this book. Seeing that I have a personal goal of never DNF’ing a book, I kept on reading. I am glad I did because Blunt Force Magic ended up being a great book to read. Blunt Force Magic is set in Cleveland, Ohio. I was actually surprised when the main character started talking about Cleveland. Besides a couple of romance novels, Cleveland isn’t a hot spot for settings for books. So, it was a welcome change for me. Blunt Force Magic has a very simple plot. Janzen is an Artificer who lost his group when they were killed. Broken, he struggled to survive for 5 years as a normal person and tries to drown out the pain and the memories. But life has a funny way of getting you back on track. In Janzen’s case, he made a delivery to a house where the door was inscribed with runes. Runes that he was familiar with. Then he battles a creature that he has only heard of in whispers and legend: a Stalker. Janzen needs to find out who summoned that demon and why. While staying one step ahead of it. With the help of friends, Janzen must defeat the Stalker before all Hell is set loose. Janzen’s character was so complex. He starts the book off with the impression of a drunken idiot who cared about no one. Until he saw the door. Then you saw a little glimpse of what he was come through before the Stalker attacked. I will be honest, I didn’t like him at first. I thought that he was kind of a jerk. But, the more into the book I got the more I could see that his swagger (for lack of a better word) was a front. He cared about his friends, old and new. He was a very damaged person because of what happened to Zachariah and the rest of the crew 5 years ago. Very damaged. I loved that he was like an onion. Every layer that was revealed, another one popped up. I love it when a character is like that. But, he did get on my nerves a bit too. I felt that he was very stubborn (like a typical Alpha male). The main characters in Blunt Force Magic were fantastic. They were as layered, as complex as Janzen was. The author did a great job of keeping them in the background and not letting their backstories overtake the story. The fantasy elements of Blunt Force Magic had me salivating as I read it. I am a huge fantasy/sci-fi geek and I love it when the “bad guys” are made even eviler than they are usually made out to be. Take vampires. They are featured in this book and they are e-v-i-l. Their fangs are huge. They are NOT sparkly. Every run-in that Janzen had with them was fantastic. I have read some reviews where this book was compared to noir/detective. I could see where they got the comparison from. Janzen did come across to me, in my head, as one suave guy. All he needed to be was a PI and he would have fit the mental image I had of him completely. What I liked the most about this book is that the good guys were not so good. Janzen was almost like an anti-hero. He was a very reluctant one too. The end of Blunt Force Magic was action-packed. Everything seemed to happen at once. Normally, that would annoy the ever-living out of me but in this case, it worked. I was a little surprised at what happened at the end of the book. I was not expecting THAT to of happened. I am glad to see that there is going to be a book 2. I am looking forward to reading it!! A) Set in Cleveland. Glad that Cleveland got some love in this book. C) The end of the book. I didn’t want THAT to happen. I was kind of mad about it. I would give Blunt Force Magic an Adult rating. This is a book that I definitely wouldn’t let anyone under the age of 20 read. There are extreme violence and extreme language. No sexual situations, though. There are trigger warnings with Blunt Force Magic. Mostly centering around the violence. If you are triggered by violent scenes with a lot of blood, I would pass on this book. I would recommend Blunt Force Magic to family and friends. I would include a warning about the violence and language. This is also a book that I would reread. I enjoyed reading it. I would like to thank WildBlue Press for allowing me to read and review Blunt Force Magic. All opinions stated in this review of Blood Force Magic are mine.